As contemporary artists increasingly engage with science and technology as sites of knowledge and power, sources of funding, or productive collaborators, artist Crystal Bennes and writer Tom Jeffreys discuss some of the key ideas, challenges, and possibilities in a series of conversations. Part 1 addresses one of the central questions in the art-science realm: that of instrumentalisation. With widespread funding cuts in recent years, the arts have struggled to put together coherent arguments about why they actually matter. Some have argued that the culture industries are an important economic asset; others that art has positive mental health benefits or fosters social cohesion. Others see art as a catalyst for urban regeneration or a way to shake people into thinking differently about each other and the world. In each case, however, the focus on use-value risks undermining art’s autonomy, its complexity, its freedom to say anything and its openness to a multitude of interpretations. Arguably these are the very things that make art valuable in the first place. When it comes to the meeting of art and science, it is often science footing the bill. When funded under the auspices of public engagement, the risk is that art becomes instrumentalised as a PR tool for science and loses the freedom to be critical or simply ambiguous. It becomes important then to ask: who is using whom, and why? Should artists help to disseminate scientific knowledge or should they resist instrumentalisation at all costs? CRYSTAL BENNES: Firstly, I find it interesting that concerns around instrumentalisation are more often held by the artist rather than the scientist in collaborative work. To some extent, I think science as a discipline is very good at publically presenting a coherent and confident argument as to its value, and the debate about instrumentalisation perhaps suggests a fear as to what art is really contributing. It’s partly a question of demarcating spaces for each and respecting different kinds of professional expertise. But, overall, I think it’s more helpful to think of instrumentalisation as two separate questions. Firstly, at the level of the individual artist: how to engage with scientific subjects without merely illustrating them. Secondly, at a more institutional level: how the work is subsequently framed. TOM JEFFREYS: I guess we focus a little differently on these two questions. As a writer, although I speak with lots of artists (including you quite often! ), my encounter with the work is usually once it has been finished and displayed in a museum or gallery. So, in the foreground are all the multiple framing devices by which the work is presented to the public: the catalogue or press release, the wall texts, other exhibits, etc. I’m often thinking about what happens to the work in that context – is it being co-opted to make a point? Because the framing around a work can have an effect that is entirely unrelated to the interests of the work itself. TJ: That’s one of the key things that those in the art world always stipulate – that the art should not be simply illustrative. CB: I understand why in that it’s part of carving out space for the value of an artistic approach to scientific knowledge, but in this instance, it’s complicated because the research I’m doing looks specifically at the question of how scientific knowledge is visualised. I’m looking both at how these images are received and understood by the general public, but also all the processes and decisions necessary to create these images in the first place. TJ: So how do you draw that line between work that visualises scientific research and work that engages with that process of visualisation? Do you even need to? CB: What I’m really interested in is laying bare the processes by which scientific visualisations are created, especially in the world of experimental physics where most visualisations are image-based interpretations of vast amounts of data, rather than photographic representations. Before the final visualisation is approved for public or professional dissemination, dozens of decisions have been made – whether by a human or an algorithm – about how to process, interpret and display that initial set of data. In turn, these decisions are not neutral choices which merely express the “raw data”. They tap into a wealth of fascinating issues around the history of aesthetics, conventions of colour or composition, as well as complex technologies – the programming languages and the data analysis software – involved in the production of the images. That’s what I’m trying to get to grips with at the moment. I’m trying to gain an understanding of these processes so that I can intervene and make images which reflect these processes critically, rather than act as pure re-presentations of them. TJ: So, if illustration makes scientific knowledge visible, then you’re making visible the making-visible? 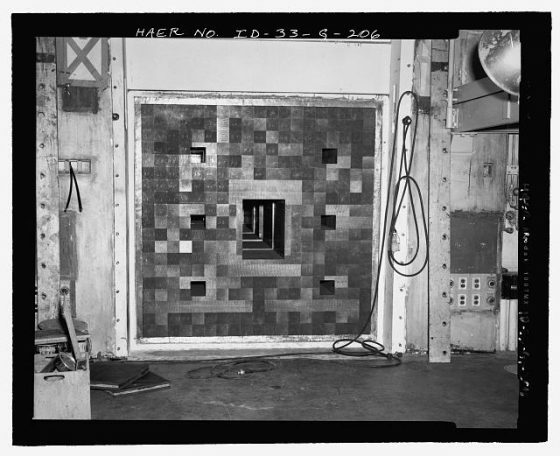 Archival photograph of graphite blocks arranged in the thermal column of a test reactor at the Idaho National Engineering Laboratory in 1951. From Crystal Bennes’ research on future cities and nuclear technologies. TJ: It strikes me as interesting that this conversation even needs to happen. I mean, from the outside, science always seems very secure in its purpose and the value that has. Art maybe less so. CB: Why do you think that is? TJ: I guess partly it’s that art can be anything at all. While that gives it a wealth of possibilities, it also makes it vulnerable in some ways, especially when it comes up against something apparently monolithic like science. I think it’s also related to the way in which art-science collaborations work: it’s often an individual artist working alone within a larger scientific institution. There is always going to be a power imbalance there. Scientists work within an institution on a daily basis: for artists, it is the object they make that receives institutional support, not the process of making it. CB: That’s not always true though. I think there is a danger of generalising about both artists and scientists. Every artist who is working in a scientific context will have a different interest. Some are much more interested in specific research while others are more interested in broader cultural questions. CB: I think of my own work as an attempt to bridge the gap between the history and philosophy of science and scientific practice, mainly because in the day-to-day research-driven culture of science, the areas don’t always have as much crossover as they perhaps should. To what degree I’m successful in that is another question, but when I talk to scientists or approach them and want information or want to go to their conferences, I never do that from a position of trying to justify why what I’m doing is important and why they should give up their time to talk to me. I think of our relationship as one between equals. It’s also worth pointing out that a lot of art-science work is produced from an academic context in which the artist is part of an institution too. And sometimes, without realising it, that institution is also taking part in a process of instrumentalisation. TJ: I think this is why the instrumentalisation question is interesting. Apart from a current tide against big technology companies, science is generally quite good at providing solutions to things and justifying itself on that basis. We cured this, we made this bigger or faster or cheaper. We can now go here. We know this. Art doesn’t really have that ability. So, if the only way you can defend art is by saying that it provides new knowledge, it loses to science. If you can only ever say it has economic value, it loses to banking. If you can only say it has health benefits, it loses to the pharmaceutical industry or religion or whatever. CB: I think that’s why I’ve found the process of applying for a practice-led PhD so interesting. Because the programme was explicitly looking for an artist who was 100% committed to fighting against the instrumentalisation of art for public science communication. CB: Well, on the one hand, there are artists who simply visualise scientific research to help people understand it. And that’s fine if that’s what they want to do. I don’t want to be prescriptive about what art should do. But on the other are often artists who are very critical of science, who see science purely in relation to, say, colonialism or capitalism. Sometimes I get frustrated when it seems like an artist comes in brandishing a sword of righteousness without really engaging science’s rich tradition of internal debate and critique. Often there is a lack of subject-specific scientific knowledge and I think that lack of knowledge – on both sides, to be honest– can contribute to this sense of an opposition between the two fields. CB: Exactly! I think we’re still a bit of a cultural shift away from being able to have that kind of critical space – especially when it comes to larger, funded collaborations – but I do think it offers one really productive solution to the problem of instrumentalisation. Crystal Bennes is an artist, writer and researcher based in Edinburgh. 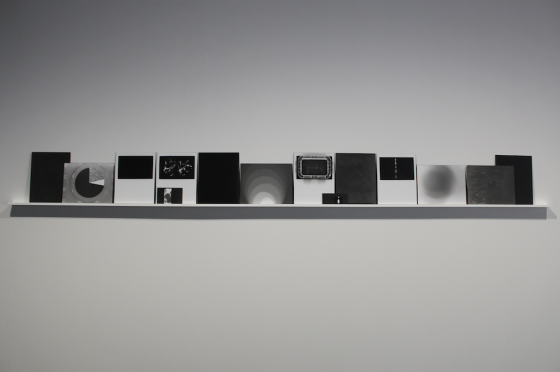 Her art explores the feedback loop between science and society and has been exhibited at the Pierre and Marie Curie University in Paris, the Serlachius Museum in Finland, the St Petersburg Public Library in Russia, the Royal Scottish Academy of Arts in Edinburgh and at Science Gallery Dublin. Crystal is also a contributing editor to Icon and Metropolis magazines and writes regularly for Disegno. Tom Jeffreys is an Edinburgh-based writer, who is especially interested in art that crosses over into the sciences or engages with environmental questions. He writes regularly for Apollo, Frieze, and Monocle, and has also been published in, among others, art-agenda, New Scientist, The Daily Telegraph, The Independent, and World of Interiors. His first book – Signal Failure: London to Birmingham, HS2 on Foot – was published by Influx Press in 2017. Tom is also the editor of The Learned Pig, an online magazine with four areas of interest: art, thinking, nature, writing.